Enjoy a satisfying meal at Cleopatra Bar and Lounge serving guests of Sunny Days Hotel. Quench your thirst with your favorite drink at the bar/lounge. Full breakfasts are available daily from 7:30 AM to 9:30 AM for a fee. At Hotel Athol, enjoy a satisfying meal at the restaurant. Quench your thirst with your favorite drink at the bar/lounge. A classic Blackpool hotel, extensively refurbished in a modern style, The Royal Carlton Hotel sits on the Promenade, between the Central and South Piers and within walking distance of Blackpool South Station. The hotel hosts live cabaret entertainment every night, and you can enjoy classic British dishes in the hotel restaurant. The Royal Carlton Hotel’s rooms have been refurbished in a modern style, and have flat-screen TV and en-suite bathrooms with showers and complimentary toiletries. Located in Blackpool, Cranstone Hotel is 1.6 km from Coral Island and offers various facilities, such as a terrace, a shared lounge and a bar. The property is around 1.6 km from Blackpool Pleasure Beach and 1.7 km from Blackpool Tower. Attractions in the area include North Pier, 2 km away, or Blackpool Winter Gardens Theatre, set 2.6 km from the property. At the guest house, all rooms come with a wardrobe and a flat-screen TV. A continental breakfast is served each morning at the property. Winter Gardens Conference Centre is 2.6 km from Cranstone Hotel. 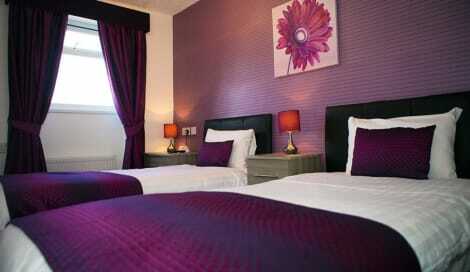 The nearest airport is Manchester Airport, 93 km from the accommodation.